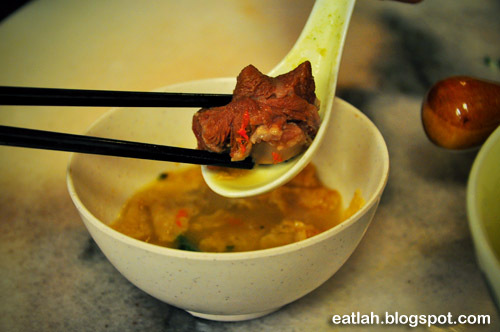 Hakka Yuen @ Taman Yulek, Cheras | where and what to eat lah? 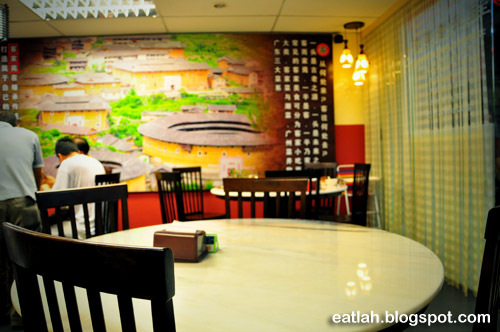 Drove past this new looking restaurant known as Hakka Yuen in Taman Yulek, Cheras and decided to give it a try. After-all, I'm a Hakka yin and a big fan of Hakka lui char. Fully air-conditioned, clean and bright interior with white marbled tables and wallpaper of the famous Hakka round houses in China known as tulou (土楼). 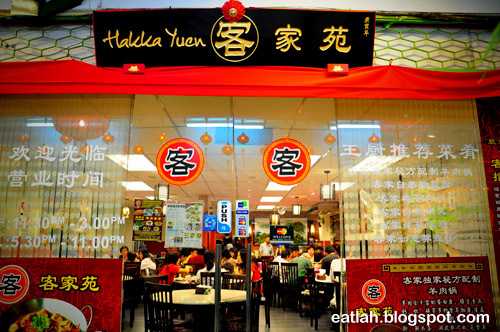 Hakka Yuen may get pretty crowded especially during dinner time despite only started few months back - they do have another branch in Melaka known as Hakka Zhan. 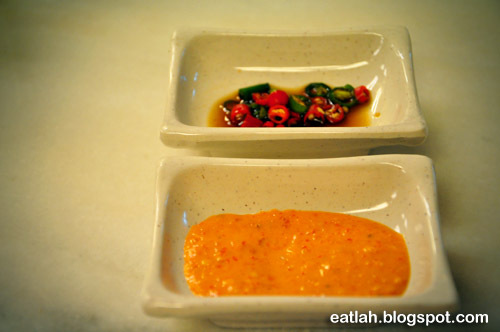 Their special concoction orange chili sauce mainly made from fermented bean curd. It was sourish, salty and spicy at the same time. Started off with the Hakka abacus beads (RM 15), mashed yam balls resembling the shapes of Chinese abacus beads. 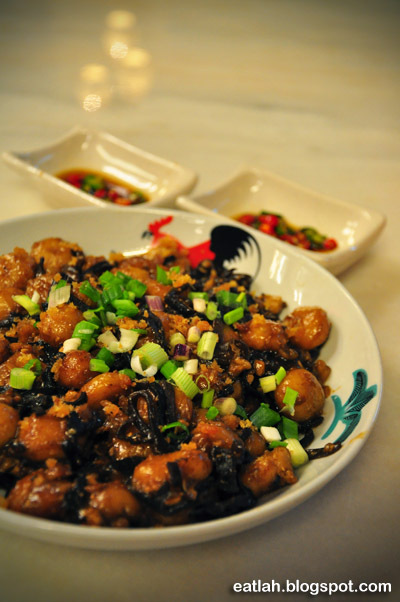 Stir-fried with minced meat, dried shrimps, black fungus, mushroom and topped with chopped scallions. It was indeed tasty and chewy. But, I preferred those with more yam in it. I'm expecting more since I paid RM 15 for this! Hakka lui char / léi chá 擂茶 (RM 8.80) is a bit of acquired taste but it is a healthy Hakka delicacy rice dish. 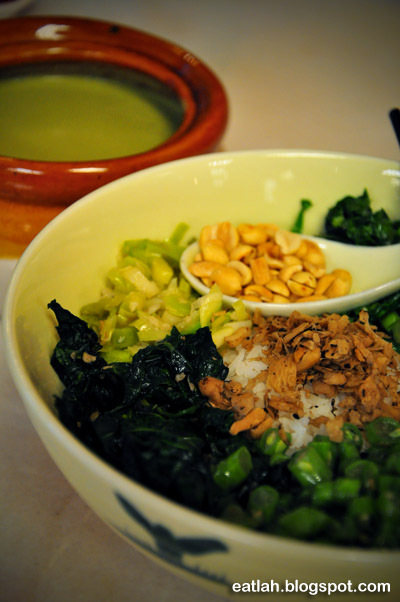 Topped with several types of vegetables (mainly shredded tapioca leaves, chopped preserved radish, leek, long beans), peanuts and served with a bowl of soup made from pounded basil, tea and mint leaves. Ever since I had one of the best lui char in Ipoh (from Jeram), I couldn't exactly find any other lui chars in KL / PJ that able to match that. It is hard to find a good proportion of ingredients in the lui char rice and I like mine with alot of chopped preserved radish. This bowl had a decent good proportions of vegetables and chopped preserved radish - just got to mix it well. 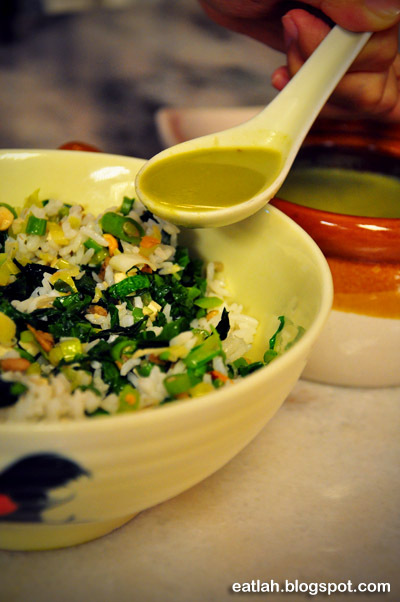 You can either consume the rice and soup separately or pour the soup onto the rice. I prefer to pour just enough soup for the rice to soak up all the goodness and fragrance. Even though the rice was good, but the soup was slightly too light and bland for me. 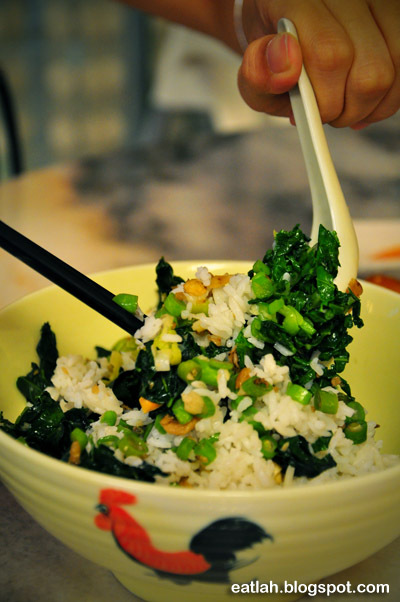 Some says, the best lui char is to actually cook it yourself - you know what you like best and it's true! Hakka mutton steamboat (RM 25), with fresh tender mutton, black fungus and bean curd skins cooked in a hot claypot of delicious herbal soup. The mutton was very fresh and tender with decent number of pieces in it. The soup was fantastic hearty and deliciously healthy with a tasty combination of herbal flavors in it. 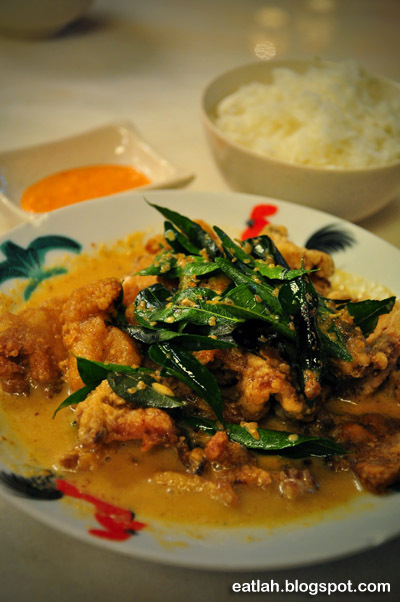 Hakka crispy fish fillet with creamy butter sauce (RM 18). The creamy butter sauce was superb with the fresh deep fried fish fillet. The aroma of the curry leaves plus the spiciness from the cili padi (bird eye chili) made this dish more fragrant and savoury. One bowl of rice is never enough with this around! 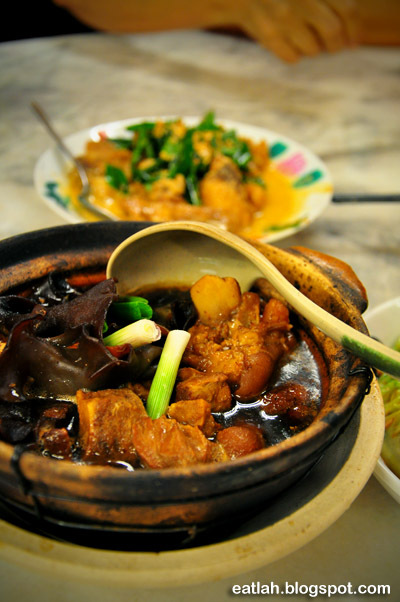 Hakka home-style vinegar pork trotter (RM 18), cooked in sweet black vinegar, ginger and black fungus. The taste wasn't rich and strong enough for me, but nevertheless, the sweet spicy sourish sauce went well with the rice. 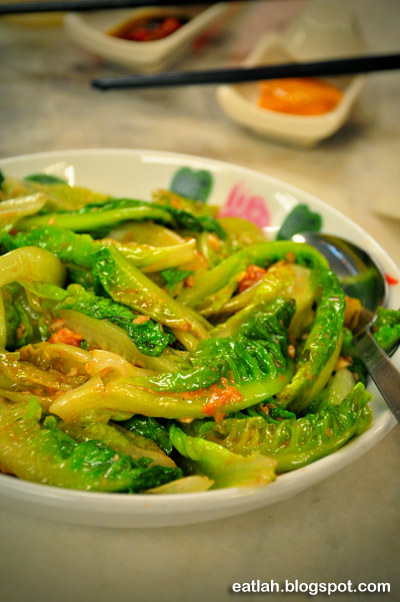 Hakka stir fried yau mak (romaine lettuce) with fermented bean curd (RM 10). It was nice and tasty. 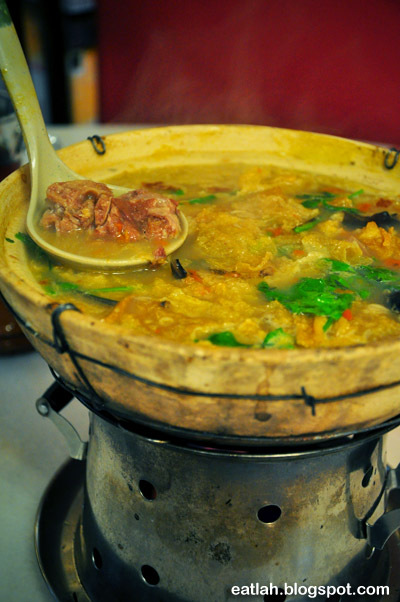 The fermented bean curd is a distinct flavor that is often used in Hakka cuisine to impart saltiness and to assuage greasiness associated with massive consumption of multiple super fatty meats. Verdict: Most of their dishes that I've tried were pretty good and definitely will return to sample the other popular Hakka dishes. Slightly expensive but it's worth it if you know what to have. ur pic makes me hungry le...=P yum yum..
found hakka yuen through google search. First impression when enter the shop is over sold pictorial of dishes and hakka village in China. Service is horror! Menu added a prefix "hakka" to common Chinese dishes. Quality of good well below expectation. Bad price/value ratio. It is first and last for me. buy it from groupon, below expectation, expensive withHakka stir fried yau mak (romaine lettuce) with fermented bean curd (RM 15), not as written RM10! Just one of example!!! Worst Hakka Restaurant ever. I ordered sweet sour pork and it came as sweet sour chicken. The boss denied it was chicken though, despite I worked in the market selling chicken for over 10 years during my primary school time. Then we ordered fried fish for two and insisted if he don't have anything for 2 persons, just let us know so that we can change to prawns instead. Fish came out for 4 persons. The only good dish was the "you mak". Rice quality was poor. Taste and ingredients below average. Overall, a very bad experience and definitely the last. Over price food and got fly in the food and said it fly in it self. Worst restaurant. Super bad service.. pls dun come here to eat..reservation at 8pm and have to wait for a table until 8.45pm.